Beam: 4 ft. 9 in. 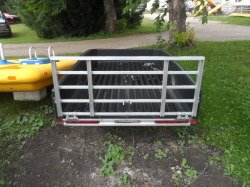 GREAT UTILITY TRAILER, THE FLOE CARGO MAX, ALUMINUM FRAME, TILT BED, TRAILER. MUST SEE TO APPRECIATE. STOP AND TAKE A LOOK.New LED lights and loading ramp.